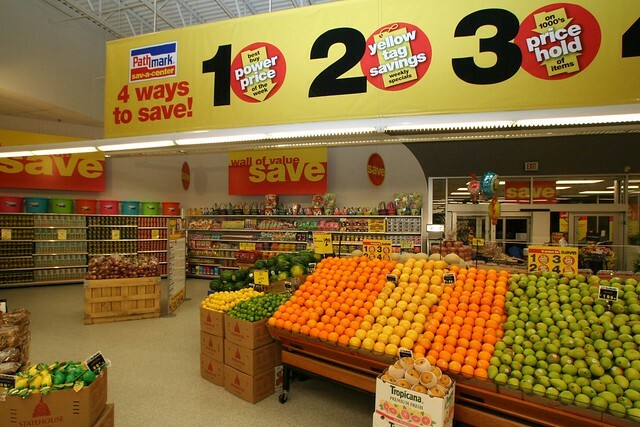 Here's something rare... a store tour with photos TAKEN BY THE COMPANY! 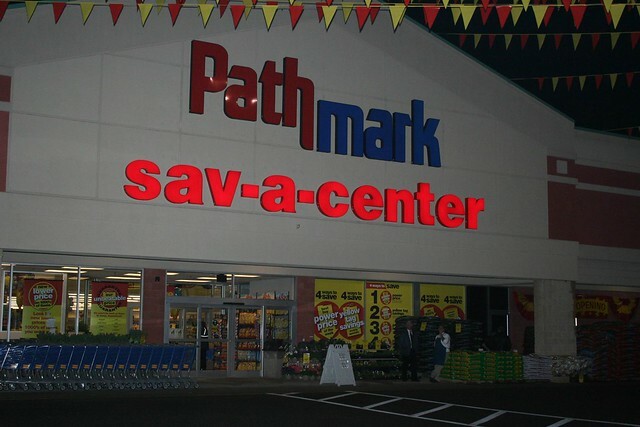 These photos were taken back when this Pathmark Sav-A-Center in Glasgow, Delaware, first opened in April 2009. 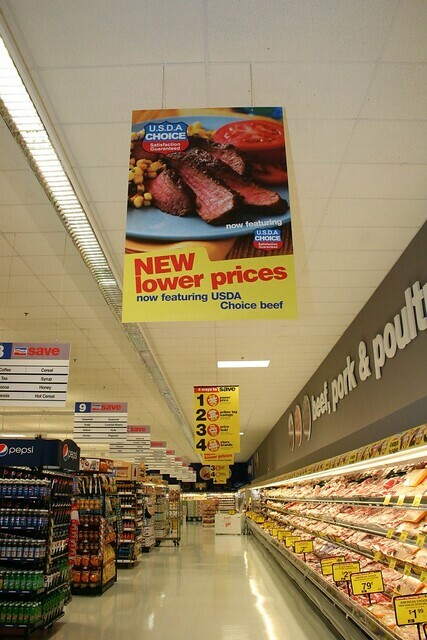 Pathmark and FoodBasics had both used Flickr pages to promote their stores to retail enthusiasts, like you. It would be nice if this was standard for every store, but the concept flopped miserably-- they didn't add them to any groups! 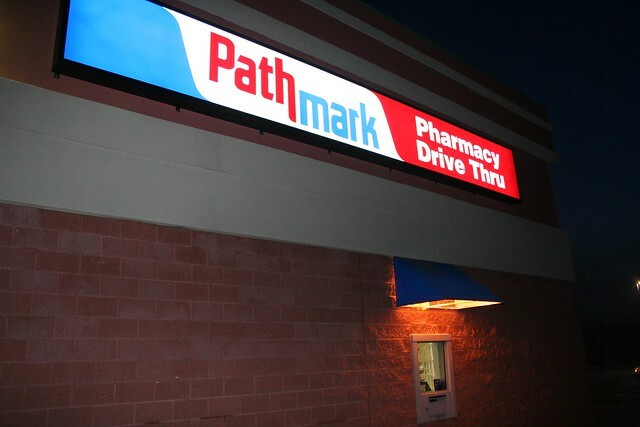 Anyway, here's the Pathmark! ...but one last thing before we get started. 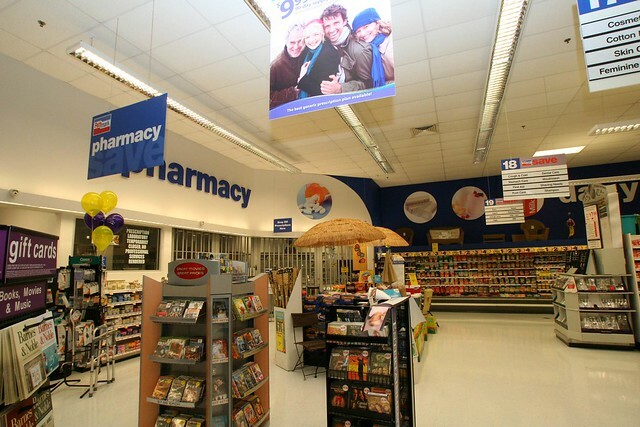 This store sat empty for 2+ years before becoming a Pathmark, so this was a rare occasion where a store was brought back to life! A very nice produce section as we enter through the main entrance. The lighting situation is very interesting... it has a Fresh 2.0 feel to it, with a lot of flashy SAVE signs. 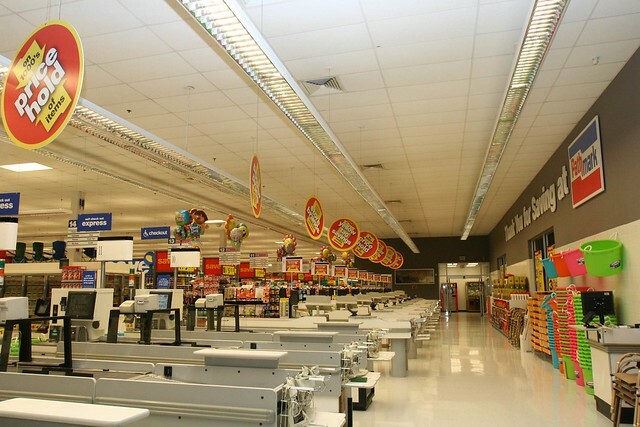 Looking into the first aisle (bread for some odd reason). 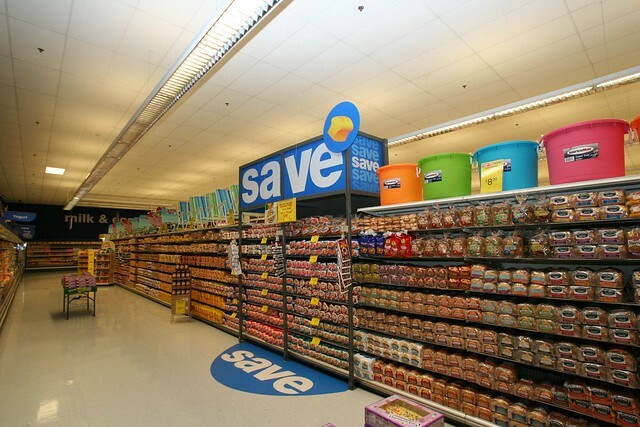 Check out that SAVE shelving with America's Choice bread in it! Love it. Nice clean floors, too! Jumping back into the cavernous produce alcove... the famous mural is gone! It's been painted over. While it was practically the same in every store, it's sad to see it go. 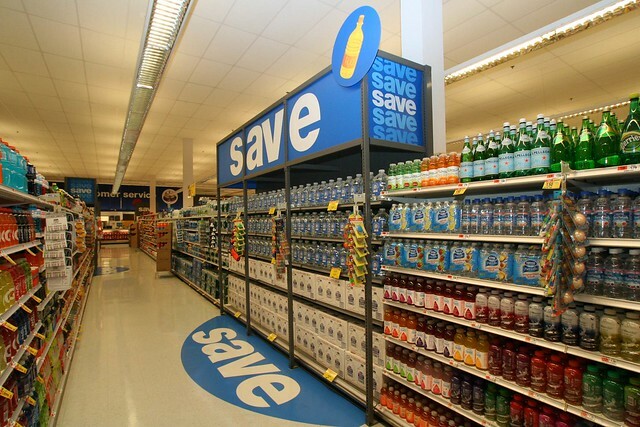 Was there one of these in every aisle? More AC products coming your way... this time in beverages. I guess this had something to do with their "Save all over the place" commercials around this time. 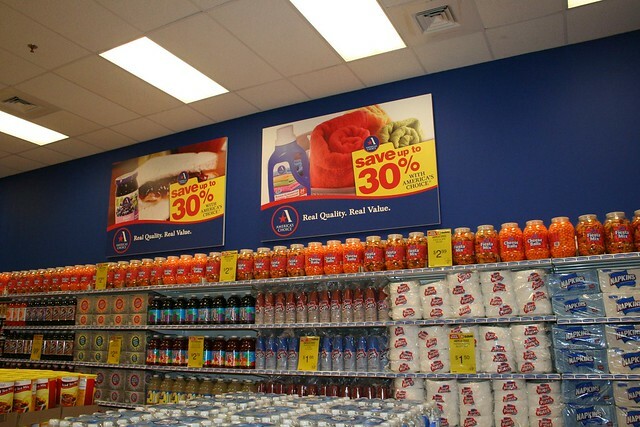 While the products advertised in the signage here show the circular America's Choice logo, it's noteworthy that NONE of the products on the shelves have that look-- they're all the older Crest-like logo from the early 2000's. 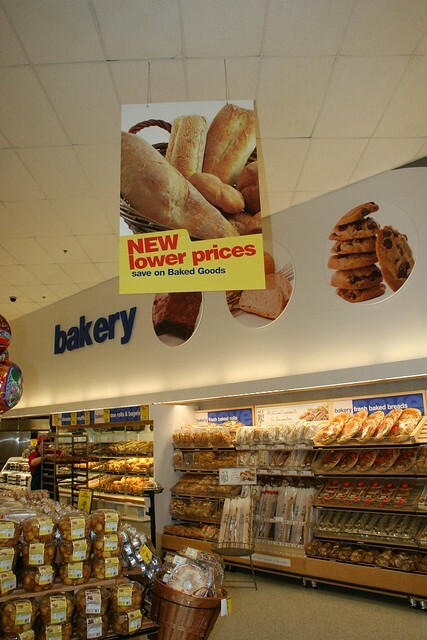 A decent bakery section, I guess? The breads don't look half bad honestly. Superfresh's signature lights still show here from the 90's Foodmarket decor. What a cramped back end! If I remember correctly, A&P took out the service meat and seafood with this store, and expanded the aisles as far as they could. ...And an odd-front-end Pharmacy. This is where the standard bank would have been in a store like this, a-la-North Brunswick. The front-end strikes me as just bizarre. 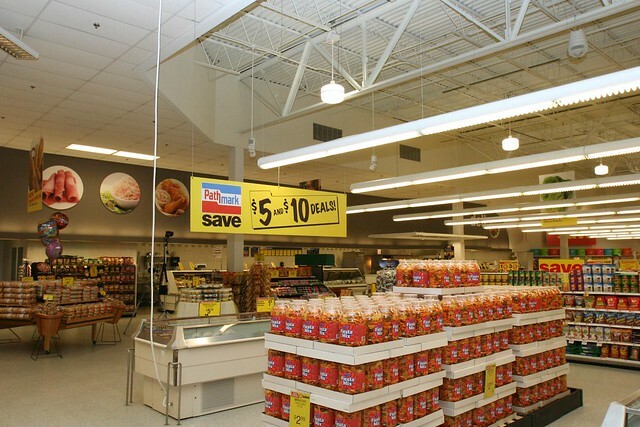 Fresh-era lights with the ad slots in them, and 90's checkouts from Superfresh with the "immediate cashier bagging system" (a bag-well next to the scanner) I'd call it. ...Did I mention a drive-thru? Thanks to... A&P for showing us around their new Glasgow store!